Hello all, excited to finally be able to make a build thread! I'm very curious about the inner working of things and details so I apologize if this gets lengthy! This is out bus, Cher, she's a 65 passenger 2002 Bluebird International 3800 with a DT466E and Allison 545. Original 138K miles from Strongsville, OH with good tires, solid running condition. I picked her up for $3k from public surplus despite the warning from the auction of a few rust issues. I had read good things about busses from Ohio so I figured the trip up from Florida would be worth it! I booked a ticket ($68 one way, couldn't beat it) to pick the bus up and make the ~1200 mile trip back down to Orlando, FL. Not having the most knowledge of diesel motors I really wanted to make sure whichever bus we bought was mechanically sound over anything, rust included. I figured rust issues could be addressed easier than mechanical problems. 4 hours later I was behind the wheel of the biggest piece of machinery I've ever operated haha. The school mechanic who gave her over to us said they checked and filled all the fluids, ran a full inspection that passed their current on road checks. He noted a small hole in the air tank, and that she had been sitting for some time so they put her on the charger for a few days prior. He cautioned us that if we stopped, be somewhere we could get a jump. 26 straight hours later we finally arrived back in FL. Exhausted. Cher, to my excitement, made the trip without skipping a beat. Powered up large grades and held steady. Not driving something so large it felt weird flooring it for an hour at a time to do 35 up hills. She averaged about 7mpg. My only note mechanically was a bit of a wobbly steering wheel from the driver side when cruising highway speeds, about 65 most of the trip. No problems noticed with the battery issue. She started right back up every time we tried. Now that she's home we can really see what we're working with. All of the seats and plywood has been removed, for better or for worse, and I've gotten myself into a bit of a competition with the rust situation. It looks like basically the whole wheel well area that has to be cut out and replaced per rust. Jump to cutting where I'm able to actually break loose a few cross beams that the metal floor is attached over the frame. So far I've cut two of the cross beams out. Debating on when to stop before I start replacing them for mainly structural concerns. That aside I'm very excited about the project. The rust has me concerned but only slightly. I can handle welding and general fabrication to right the rust wrongs and convert everything accordingly. My next step is to grind out the heavy rust, and treat as needed. I've picked up this product from Amazon to handle all of the converting, interested in what you guys think about starting with this. A few questions/concerns I've gathered thus far. I appreciate any and all insight as I'm doing all of this myself to cut costs and am not afraid of getting dirty. I've done my research with most of my questions but am always curious to others opinions. -Rust on the undercarriage. My first instinct is to wire wheel off the heavy stuff basically everywhere under the bus, and treat with a converter in a sprayer layer after layer. What amount of rust would make you try saving or just cutting out? Is there anything I should directly not spray the converting agent onto? I'd like to hit damn near everything under the bus. From bumper to bumper if possible. -Replacing cross beams and cutting more floor sections out. My plan is to pick up some square steel tubing to replace the beams and weld back into place. In the mean time should I worry about cutting more of the floor and potentially more cross beams out without some crazy structural disaster happening? I'm optimistically hoping the sheetmetal only has the worst of the damage, and between patching/converting I won't have to replace too many more beams. -Batteries have since given out from sitting I assume. The three batteries in the tray look pretty factory so the least I could do is replace them. Soon. Should I bother trying to charge them at all? It would be nice to get the bus running again but if it would be more worth just buying new batteries anyways I'll do that. Battery suggestions? -Air tank replacement. I'm confused by this but I fear I'm overthinking it. I've read about multiple stage tanks and air dryers (which we have that works great) and multiple different fittings etc but now I've overwhelmed myself. Will most big rig type air tanks do the job assuming they have the same amount of fittings needed? How many air lines should I expect to delete? If you managed to make it through all of this let me reward you with this fancy video my good buddy made for us on the first real demo day. Thanks again for any insights and I'll be sure to keep this updated as much as I can! I bid against you on that bus! I was going to part it out, I need the engine. I'm near Orlando. I keep my buses out at a friends in rural Apopka. Hit me up some time, we should get together and talk buses! Haha! Well that makes me feel better about bidding! Wasn't trying to have to worry about a break down along the road. Thats rad you're so close. Space for multiple busses sounds awesome, I'll definitely be getting ahold of you haha. I'm in downtown Orlando, it's a miracle I haven't heard anything from code enforcement. Cheers for cool neighbors! I managed to cut out more of the rusty floor today by the driver seat/stairs. Cross beams seemed pretty well rust free thankfully. Has anyone ever tried using pressure washers for removing rust? Would it be worth the effort? Thinking it'll keep the dust down and help a ton getting everything on the undercarriage, which has me stumped thus far. Wire wheel just sounds like an insane amount of work to get every nook and cranny so I've been banking on other methods. You might consider scraping off what you can and then coating with Por-15. It’s designed to go on without prep and it’s stops/neutralizes the rust! Great stuff supposedly. You heard good things about Ohio buses? Has to be a first. Rust Belt of Ohio where they salt and brine the roads a lot. They're usually well taken care of mechanically, but usually pretty rusted. I really wanted to make sure mechanically there wasn't much to worry about. The rust is at a manageable level, just trying to figure out the quickest way to deal with it. Been humoring a scaler to try and get the heavier stuff. Current plan is to convert/paint the top side and por-15 the bottom. Got the heaters/hoses all out today, every last one. I was thinking it might be worth keeping maybe the driver heaters, but once i dug into it they looked a little too worn for my taste and got pulled also. Being in FL the last thing on my mind is where my heat will come from. For sure! That stuff will work great on the undercarridge just for that reason! yeooww!! too funny if EC had won I woulda been the one making the 1200 mile trip in it driving it down for him.. yeah strongsville is about the last place id buy a bus from for Body condition. 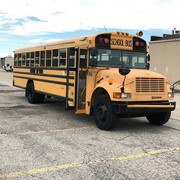 but Ohio busses run like champs.. the inspector is just now starting to fail them for rust but theyve always been sticklers on mechanics..
awesome that its yours and it runs good!! just replace rusted sheet metal and move on is how id handle that.. even ohio busses usually dont rust through the ribs and frame... although that area is one of the saltiest in the state due to Lake effect snows.. DO check your body mounts.. the bpdy mounts often end up loose as the rubber isolaters deteriorate away leaving the body to move on the frame in severe road conditions.. they look like little clips holding the body down to the frame..
Good to know! I definitely wouldn’t want one of those to come loose haha! The two ribs I did cut out were probably me jumping the gun, replacing those and the sheet metal soon. The rest of the body is in great shape so once this floor situation is over it’ll be a huge relief.